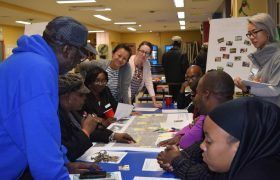 While the federal Department of Housing and Urban Development (HUD) continues to sidle away from its job of preventing housing discrimination, the New York City Department of Housing Preservation and Development (HPD) in partnership with the New York City Housing Authority (NYCHA) have stepped up with a comprehensive fair housing planning process to head off segregation in New York City. The city announced today the launch of Where We Live NYC, a fair housing plan to fight segregation and unequal access. The plan outlines a process to study, understand, and address patterns of residential segregation and how these patterns impact access to opportunity, including jobs, education, safety, public transit and health. The plan will include extensive community participation and provide data and policy analysis that will culminate in the release of a public report that outlines measurable goals and strategies for fostering inclusive communities, promoting fair housing and increasing access to opportunity.